Finally got my first 0% IV Pokémon. I caught a 0% Squirtle once, but I threw it out because I only keep the best. I think 0% are special, so I just keep them. They are rarer then the 100 IV’s, I got today a 0% Drowsee. That’s a fair point, I know, but that’s not my gig. I even had a Shiny Level 1 Pokemon before, and those are very rare as well. I traded it to someone who collects those, because that’s her gig. It’s just not mine. Got 1 O% and I think 5 100%. I don’t know what I’ve collected more. I started checking for 0% IV Pokémon maybe a week or two ago. I’ve seen 0 IV only a couple of times (I recall one was an Eevee). I can’t show them here, because each was sent immediately to the professor for a candy (and to free up space in my Pokemon storage). 0,0,0 Pokémon are just as uncommon as 15,15,15 (perfect IV). I has a zero Pikachu, it will always stay in my collection. I caught a few from time to time, but I immediately dispose of them. I’m not sure about that, because you can’t get a 0% from Research Breakthrough, Field Research, Special Research, Eggs, Traded Pokémon that have become Lucky and Raids. But you can get 100% IV Pokémon from the options that I’ve mentioned. 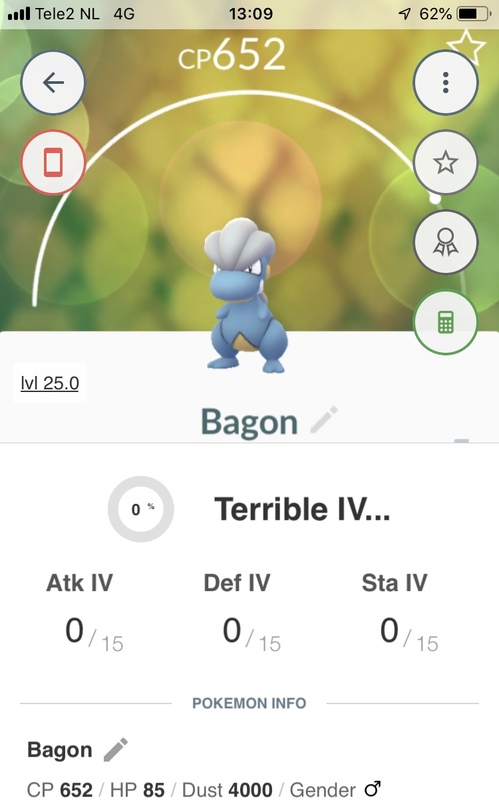 I guess 0% IV are rarer, but in the wild, I think they are as rare. I wonder… How many people have the time to check the IV of EVERY Pokemon they capture? I know I tend to view very-low-CP captures as not worth the bother to check, considering that even a high-IV mon with very low CP would consume more stardust to power up to fighting trim than it’s worth. I suspect a lot of Pokemon with IV under 20 never get checked. So quite a few that have 0 IV are never noticed. How many people have the time to check the IV of EVERY Pokemon they capture? I do. Every single Pokémon. 0% Pokémon are at least 3 to 4 times more rare than 100%. That gets to be a lot of overhead. Do you do so as you catch them, or keep 100 or so empty storage slots for a catch cache and then check 'em after your expedition?